We can't thank you enough. The landscaping is beautiful. Your crew is extremely professional and their attention to detail is commendable. Lupe and Geronimo went out of their way to make sure everything was perfect. Our trust in you Don is endless. You are like part of our family. Your creativity, diligence, and business acumen is untouchable. 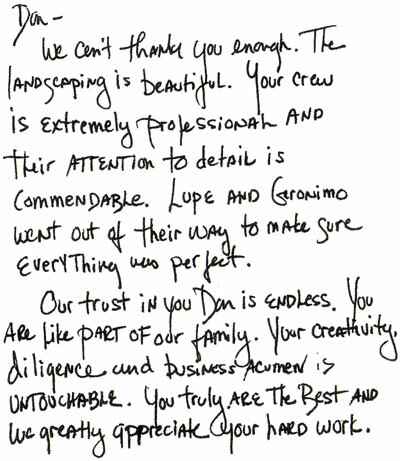 You truly are the best and we greatly appreciate your hard work. 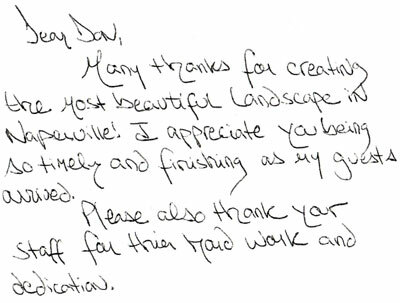 Many thanks for creating the most beautiful landscape in Naperville! I appreciate you being so timely and finishing as my guests arrived. Please also thank your staff for their hard work and dedication. 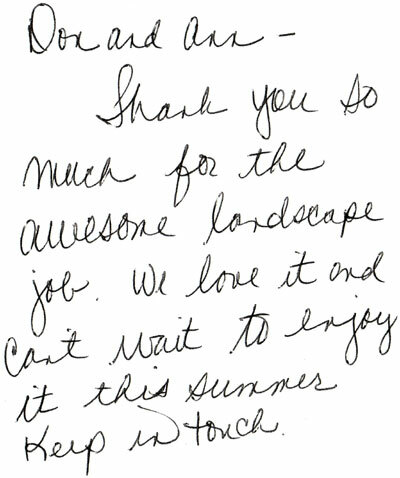 Thank you again for the wonderful job you and your crews did on my patio and rear yard landscaping. A plus for the extra landscaping on the sides and front on such short notice. 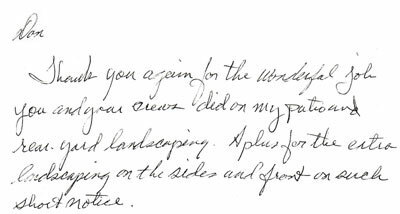 We wanted to thank you and your staff for our beautiful landscaping. We are thrilled with the outcome. We know this came about through a lot of planning, dedication, and hard work from people who care about their job. We are the envy of the neighborhood! 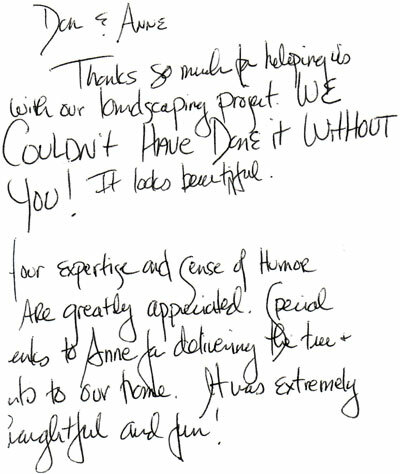 Thank you so much for the awesome landscape job. We love it and can't wait to enjoy it this summer. Keep in touch. Thanks so much for helping us with our landscaping project. We couldn't have done it without you! It looks beautiful. Your expertise and sense of humor are greatly appreciated. Special thanks to Anne for delivering the tree & info to our home. It was extremely thoughtful and fun!